Pano Logic has updated its desktop virtualization system to provide support for Microsoft Windows 7, tighter integration with VMware View VDI management tools, and additional end user controls. The goal of Pano Logic technology is to provide users with a PC-like Windows experience while reducing the IT burden of managing endpoint devices. Pano System 3.0 consists of hardware--the Pano Device--and software--Pano Manager and Pano Direct Service. 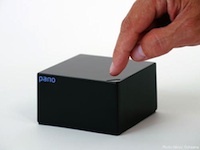 The Pano Device is a hand-sized box that contains no CPU, memory, operating system, drivers, software, or moving parts. It connects over a network to a Windows virtual desktop running on a server and provides a means to connect peripherals (keyboard, mouse, and monitor) to that virtual machine. Direct Service is a program within each virtual desktop that links the peripherals attached to the Pano device to Windows drivers in the desktop virtual machine. Pano Manager is a Web-based console that lets administrators manage the virtual desktop deployments. The new release of the system integrates better with View 4, VMware's management scheme for virtual desktops, which, the company said, would simplify the job of administering a mixed environment consisting of both Pano Logic virtual desktops and PCs or thin clients. Pano System 3.0 provides support for Windows 7 Enterprise, Professional, and Ultimate editions and allows users to maintain both Windows 7 and XP desktops. The latest version also incorporates end-user functionality, including the ability to reboot their virtual machines, lock the desktop, and access a new one in the event of a problem. These additional features let users continue working while preserving the original for IT to examine and diagnose. Pano System 3.0 also enables users to maintain multiple virtual machines. End users have the option to transition between various virtual machines assigned to them by clicking on the environment of their choice. One solution provider, Abtech, has added Pano Logic's systems to the technology mix it offers its client base, which includes several unnamed community colleges in California. "Abtech's custom design based on the Pano Logic platform will cut associated costs such as power consumption, staff time and efforts, network and data security, and allow for better interfacing with technology to increase company profits," said Bob Russell, president of Abtech. The company has 18 service offices throughout the country and performs maintenance and support services.